Through the Haitian Hustle Virtual 5K, you can provide an education for children in poverty, simply by walking with your loved ones for an hour this August—wherever you live. 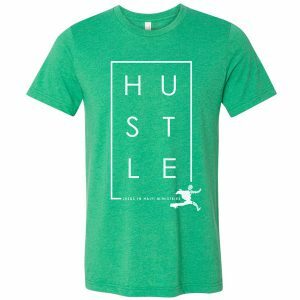 Register to Hustle for $25/person. Registration for 2019 will open in June. Pick your date (if August 17 doesn’t work for you) and then invite friends to join you. Put on your Haitian Hustle T-shirts* and go for a 3.1 mile walk (or run, or jog…)! All proceeds of your $25 registration fee go to support education expenses at Grace Emmanuel School, the Lighthouse Children’s Home and Lighthouse Legacy. THANK YOU for running the race with JiHM! *Register by July 31 to receive a T-shirt before August 17. If you register after July 31, your shirt will be shipped at the end of August. Haitian Hustle 5Ks are already planned in the following locations. Choose your location to find out how to register for those specific events.